To be prosperous, one needs a deep understanding of who and what you are and what you want out of life. Getting there can be hard work but this book makes the chore easier. With prompts on how to reach financial decisions and plan for short- and long-term goals, Kadish and Mayer guide readers to establishing the confidence to take charge of their finances. 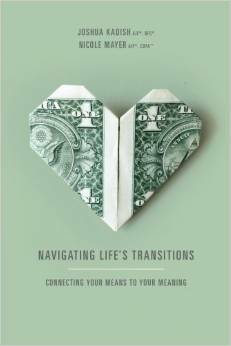 Navigating Life's Transitions: Connecting Your Means to Your Meaning provides anecdotes to illustrate what to know, what to consider, what to ask, and what steps to take to uncover your own life's purpose—and create the financial foundation you need to fully experience it. This is not a "one strategy fits all" guide. Instead it is a guided journey to find what matters to you personally and how to achieve it financially. The answers will come from you—the authors help you identify what is of greatest importance in your life and how income and assets figure into that.